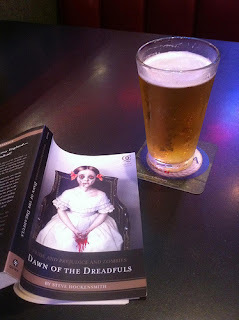 Starting a library sponsored book club in a bar can be a wonderful experience. You connect to your community in ways you just can’t replicate in a library building. I currently run Books on Tap for the Northbrook Public Library, and before that, I helped run LitLounge, a co-sponsored book club between the Morton Grove and Skokie Public Libraries. Here are a few things that I have learned. If you’re reading this, you are probably already convinced that starting a library book club in a bar is a great idea. But sometimes your manager or administration isn’t as keen on the idea, and if that is the case, you must make a good argument for why the library belongs in this location. The idea of a library run program with booze freaks some people out! So, if you find that you’re getting some resistance (or even if you’re not), you should try writing a proposal. Writing out your reasoning will not only help you formulate your argument, but also gives your manager or administration something to take to the board. The purpose of this book club is to attract and engage residents who may not already be attending library programming and possibly don’t even have library cards yet. These types of programs attract new patrons, of varied ages and backgrounds, and give the library a hip, new image. Make sure to include any area libraries that are already doing this sort of program already. A good library to reference is Oak Park Public Library, who has been running Genre X for over 7 years now without any issues. Also pay close attention to your wording in the proposal. Sometimes getting people on board is as easy as changing your wording from “book club in a bar” to “book club in a restaurant”. And who doesn’t like restaurants? It is pretty common for libraries to label book clubs like this as being specifically for people in their 20s and 30s, but this is going to vary from community to community. For example, Northbrook doesn’t have a large population of people in their 20s - so my target patrons are working adults between the ages of 25-50. Most of my actual attendees are 40 and up, and I try to keep this in mind when I’m thinking about book selection, advertising, and pretty much everything I do. For example, since most of my attendees are commuters who ride the train to work, I put flyers, and posters at our local commuter train station. The location of your book club can really make or break you. So do your research. Grab a library buddy and hit the town! Trust me. This part is fun. While out and about, think about whether the space you’re in could actually accommodate a book club. How loud is it? Is there a private room? Are there any large tables? And how is the service? You are going to be working closely with these people, so make sure you actually WANT to work with them. Once you think you have scouted a location, ask to speak with a manager. This isn’t something you can just pop in and start doing – you absolutely have to communicate with your location. Find out when their slow days are and explain that you could bring 10-20 people on a slow night. That way, this is a good deal for them, too. And this part is super important, so I will bold it…are you ready? Make sure they know you need separate checks. I cannot stress enough how important this is, and remind your server at every meeting that you will all need separate checks, regardless of the number of attendees. If they are cool with it, then you have yourself a location. Similar to location, book selection can make or break a book club. Put some serious thought into what books you think your target demographic will be interested in reading. What’s fun with this type of book club is you get to pick books you could NEVER pick for your in-library clubs. Think about hip, interesting reads. Honestly, think about what YOU want to read. It probably would be a good fit for your club. Still feel stuck? Try Book Riot, the Bookrageous podcast, or IndieBound. Think outside the newsletter box. Don’t get me wrong – you need this in your newsletter. But make some cool posters and put them up all over town. Promote heavily on your library’s Facebook page. And most important, have some sort of presence at the location itself. Get some posters in the bathroom. If they will let you, create a deposit collection and stick your flyers in the books. Hopefully this will help get you started. This program is so much fun and so very rewarding. And if you do it right, you can start a social outlet for the people in your community. Leah White is a Reader Services Librarian at the Northbrook Public Library and a 2012 Library Journal Mover and Shaker. You can find her on Twitter, @leahlibrarian, or check out her website: leahwhite.weebly.com. What if your library's lawyer says no go? What then? Hi Julie! That's a tough but very valid question. Since I'm not an attorney, I can't speak to the true legality or liability issue. But I can say that at my past two libraries, the boards and attorneys didn't find issue because the library was not providing or purchasing the alcohol for patrons. Some of my members in Books on Tap just get a soda and dinner! But seriously, I think this points to the importance of writing a strong proposal that notes the successful libraries that have been doing this without issue for many years, particularly Oak Park. It would maybe even help to contact someone at Oak Park to see if they would be interested in speaking with someone in administration to address the issue. That said, some people will always be naysayers. But hopefully it with the right arguments and the strong support of administration, the idea can pass. Love this and attempted one at my old library and am planning it again at my current library. A big issue was the booze (are we encouraging drinking by being in a bar) and instead went with a small tea/coffee shop that also served a few beers on tap - thus everyone was happy. Except for the Friend's group which was somewhat unhappy about having an off-site programming at all. They felt it moved people away from using the library. Are argued against this in that I partly considered the programming as outreach. The ages varied from teenagers to the elderly (which was awesome) and, in my opinion, multi-generational is the way to go. The secret is to choose good books and our librarian did a wonderful job of finding the perfect books to get a nice intimate crowd of varying ages. For promotion, I think the venue is your primary point of promotion. I don't want people from the library meeting at a new place, I wanted people at the new place seeing the library there. So signage and promotion at the venue is key. Currently, I am shopping around for a new venue to do an off-site bookclub and have not found a good fit yet.